We love collecting recyclables, Junk and we have a collection of bottle lids/caps. I store them, they are easy to find and fun to play with. Magnetic stuffs are our all time favorite and this time we created Magnetic bottle lids. Magnetic bottle lids are perfect to create/recreate collages on a cookie tin lid/ Cookie tray. 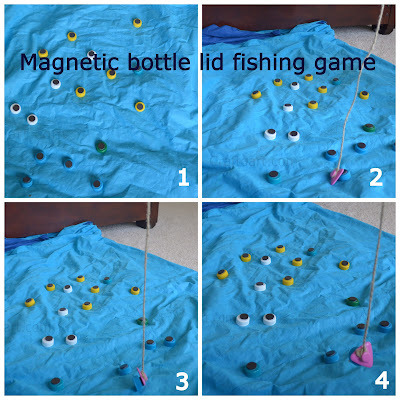 We also played fishing game with bottle cap magnets. Remove the foam adhesive stickers and stick the magnet to the flat side of the bottle lids. If you are using non-adhesive magnets, use a strong glue and glue the magnets. Magnetic Bottle lids, for added fun create a whole bunch! Stay tuned and check out how we converted the magnetic bottle lids to a fun educational alphabet play! We are taking part in the 100 days of play blog hop co-hosted by Sun Scholars and Life at the Zoo, the blog Hop combines 100 blogs from around the world and 100 days to showcase simple ways to play. This post was part of the blog hop. Do stop by and check out the simple ideas shared on how to connect with your children through play! New ideas shared each day from 4/1 – 7/20! I love that you are using recycled items to make something new and fun to play with. What a great idea! Thanks for sharing in our 100 Days of Play! Your post has been linked and shared! What a great idea! Pinned! Thanks for sharing this idea on the Sunday Showcase. I featured it this week on my blog and pinned to our Pinterest board. So clever! I need to start saving up our bottle caps! So clever! I need to start saving up bottle caps! I love this idea! I've been saving bottle caps and this would be a great use for them :) Pinning! ©Craft to Art May 2012. Picture window template. Powered by Blogger.